Newcastle manager Steve McClaren is under more pressure after his spending at the club, according to ex-Magpies caretaker boss John Carver. McClaren has spent about £80m since replacing Carver last summer but his side are in the Premier League relegation zone. "When you spend that amount of money it brings pressure with it," said Carver. "Maybe one or two of the players and staff are feeling that pressure. What you have to do is get over that." He added: "You have to find a solution, a way of putting that to the back of your mind and trying to get out there and give a performance." Newcastle were thrashed 5-1 by Chelsea on Saturday and have picked up just seven points, including two wins and 10 defeats, from a possible 39 away from home this season. "They've got 12 games left and they have got to find a way to get 40 points so that is five wins and a draw," Carver told BBC Sport. "That's not going to be easy when you think they have only won six games in 26. It is going to be a difficult time but I think there is enough ability in there. "They need to find a solution also away from home because they don't pick up enough points." Carver took over as caretaker manager of the Tyneside club at the end of 2014 following the exit of Alan Pardew to Crystal Palace. He won three of his 20 games in charge but led the Magpies to Premier League survival on the final day and left the club in the summer before McClaren was appointed. "I think it's a harder job than he thought when he first arrived," said Carver. "I think he thought it was going to be easier. "There is a lot of pressure of managing Newcastle United. They have had so many top managers in the past - Kevin Keegan, Kenny Dalglish, Ruud Gullit to name a few - big personalities and names in the game and they have found it very difficult. "McClaren has got enough experience. He has won the championship in the Netherlands, he's managed in Germany and managed England where there is more pressure than anywhere. If he can't handle it then there's not many who can." McClaren kept Fabricio Coloccini as his captain after taking over at Newcastle but Carver has questioned the centre-back's "leadership on the pitch". "He is not your modern-day captain," said Carver. "He keeps himself to himself. He tries to organise things behind the scenes with the players - nights out, paintballing and that sort of thing. "But when it comes to leadership on the pitch, he is not vocal enough for me. He needs to be more vocal and get people together because in times of trouble you need leaders. "He has got to step up now. 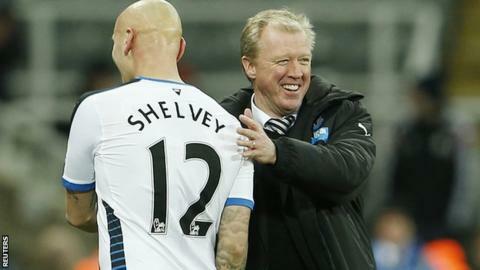 Along with the experience of the likes of Daryl Janmaat, Jack Colback, Jonjo Shelvey, Moussa Sissoko, they have got to get them together and say: 'Come on, we have to get this sorted and make sure we are not playing in the Championship next season'." Is Carver keen on returning to management? Carver says he has "turned down a couple of job offers" in England but is keen to get back into management as he prepares to go to PSV Eindhoven and Belgium on research exercises. "I'm just ready for when a job does come up," said the 51-year-old. "I've got an open mind. You can't plan because things happen when you least expect it. "I've worked abroad before. I've worked in the MLS in America and I wouldn't rule out going abroad. "If something comes up in the Championship then great. If it's League One and the right club then great. "I've turned down a couple of job offers that I felt weren't right for me because my next job is massive and I have to make the right decision."